NATO troops in Afghanistan have unsuccessfully tried to impose a foreign ideology in a war unwinnable by military means, the UK military has said. The planned 2014 pullout is expected to leave Kabul unable to survive the Taliban onslaught. The Afghan mission of the NATO-led International Security Assistance Force (ISAF), now in its 12th year, closely resembles the failed Soviet occupation of the country, a damning British internal report argued. The document was prepared in November last year by a British Ministry of Defense think tank and obtained by the Independent newspaper under the Freedom of Information Act. 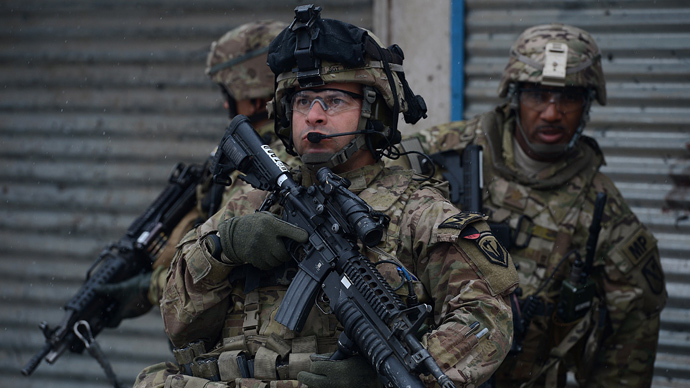 Most NATO troops will pull out of the country next year, leaving behind a fragile and unpopular national government and a strong armed opposition, much like the Soviet Union, the report noted. The assessment, which a Ministry of Defense spokesperson said was meant “to stimulate internal debate, not outline government positions,” mirrors another assessment prepared by the UK-based International Institute for Strategic Studies (IISS). 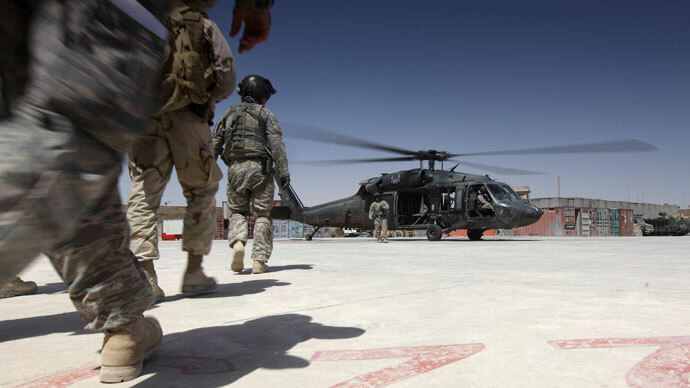 In its annual Military Balance report released this week, the think tank forecast that the Afghan insurgency would not be eliminated by the end of 2014. Colonel and Afghan war veteran Evgeny Khruschev believes that both Soviet and American campaigns in Afghanistan bear strong similarities. “Foreign occupation of Afghanistan, again. In historical perspective, 9/11 and subsequent US invasion in Afghanistan is delayed iteration of CIA’s Wilson’s War: a strategic payback for American anti-Soviet proxy jihad in Afghanistan. They have put in motion chain reaction and now, after 12 years, still have no clue how to control & manage their runaway ‘freedom-fighting’ terrorist assets,” he told RT. The colonel is also sure that ‘US learning curve in Afghanistan has been inverted from day one’. “Washington had studiously ignored the Soviet lessons learned – only to repeat all Soviet mistakes on a larger scale and pile up on their own genuine blinders,” added the veteran. The transition talks between Kabul and the US-led ISAF are continuing amid bitter accusations and recriminations. Last Sunday, after two suicide bombers killed 19 people, Afghan President Hamid Karzai accused foreign troops of colluding with the Taliban to justify their presence in the region. The allegations provoked a rebuke from several US officials, including ISAF chief Joseph Dunford. 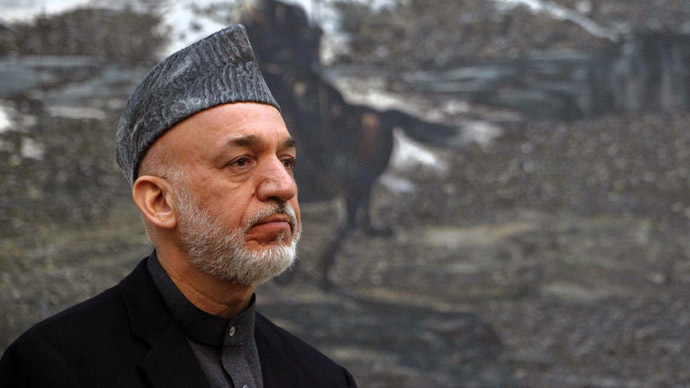 The US general said in an advisory obtained by the New York Times that "Karzai's remarks could be a catalyst for some to lash out against our forces." The day after the Afghan President’s comments proved to be the deadliest for NATO troops in the country in 2013. Two US soldiers were killed and 10 were wounded in a suspected insider attack by a man dressed in an Afghan army uniform, and five Americans were killed in a helicopter crash that was blamed on bad weather. "We're at a rough point in the relationship," Dunford said in his advisory. "[Militants] are also watching and will look for a way to exploit the situation – they have already ramped up for the spring." In a move to mitigate the damage, Karzai’s office said Thursday the US and Afghanistan remain strategic partners, and that his statements "had been to correct rather than damage this relationship." 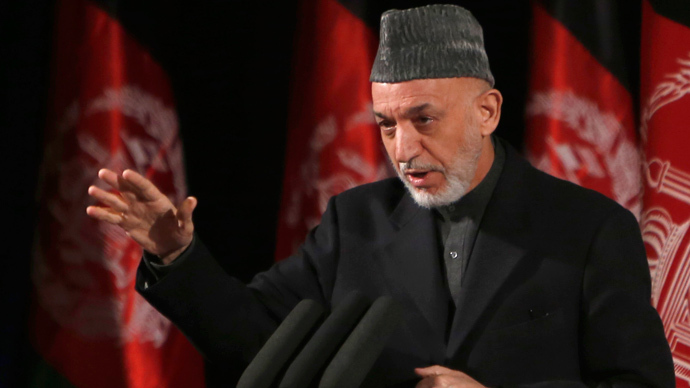 The harsh exchange came as Karzai has ramped up his nationalist rhetoric, pressuring for a swifter transition of authority in the country from foreign troops to the Afghan security forces. The president recently clashed with the US Military over repeated delays in the scheduled handover of Afghan detainees. He has also banned foreign troops from university campuses, and banned US Special Forces from two provinces over claims of harassment. Karzai also stopped Afghan forces from calling in US air strikes.